Log in as an administrator and run the Notify installer to install Notify on your Mac OS X computer. Note: Depending on your security settings, you might be required to press the Control key and click your mouse at the same time (or right-click) and select "Open" from the quick menu. Notify will now be running and will also start up automatically every time a user logs in to the computer. Pharos Notify is an application that can present information to users and optionally collect responses. Notify is a background application, so it will only be visible to users when information needs to be displayed or gathered. Mac OS X version 10.4, 10.5 or 10.6. Version 6.1 or later of the Uniprint server components. Obtain the file Notify.dmg from Pharos Systems. Double-click this file to create a new disk image in Finder. This disk contains the Notify 8.1 installer, Notify.pkg. Click Install (or Upgrade). The installer automatically installs the Notify 8.1 application. Pharos Notify will now be running on the computer and will be automatically launched every time a user logs in. 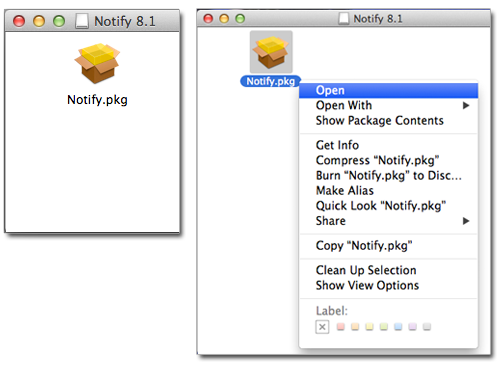 If Notify is used together with Pharos Popup for Mac OS X, follow the instructions in the Popup documentation to set up printers for Popup printing. If Notify is used without Popup, refer to the Mac OS X Help for instructions on how to set up printers. Select Pharos Notify and any other Pharos components that you would like to uninstall, then click Continue. If there are printers on the network that support Apple’s Bonjour technology, users may be able to bypass the Pharos printing system. To avoid this problem, disable the Bonjour features of any such printers. If the software firewall (ipfw) on the computer is active, port 28201 must be opened for TCP traffic for Notify to work. The firewall in Mac OS X is disabled by default. If it has not been manually activated, these ports will already be open.